The business members at your church have a tremendous amount of influence in the workplace. Every week your church members walk into the most strategic mission field in the world .... their workplace. Sunday church-goers are Monday's missionaries. The business leaders in your church have an awesome opportunity and responsibility to leverage their influence in the workplace. 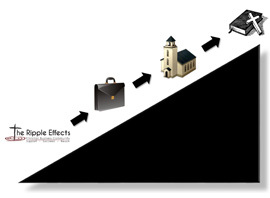 Please consider partnering with us at your church and let us show you how we can support and inspire the business people in your church and how we can help them become more successful so that they will have greater resources and be better equipped to help your church reach more people for Christ. Build a stronger church community by bringing the Christian business community together. Add value to your business community thereby increasing attendance and membership. Helps identify resources within the business community. Increased financial giving through increase in financial success of business and stewardship focus of community. Your business community will be better equipped and feel inspired to be more intentional about living out their faith in the workplace. Sustainable, turn-key and self-funded business ministry model. Minimal church resources used. Highly motivated participation from business community. This is our only focus and we are continually adding resources and improvements to be on the leading edge of workplace mission. Online community platform that is second to none. All resources gathered into one location that help us with our mission of Support, Succeed, and Reach. Local church business community becomes part of a greater workplace mission movement. Combining resources from multiple local church business communities increases our impact exponentially and helps us to be a greater catalyst for change in our city communities. TRE substantiates Christian financial stewardship principles not only because we do require financial stewardship by our members to join but also in our terminology and presentation of everything that we do as an organization. Manage discipleship training groups for business people in all positions, driving a living out your faith in the workplace initiative. Emphasis on being intentional about the community's missional purpose in the workplace endorsing the church's mission of reaching people for Christ. For more information click here to contact one of our team members or call our office at 623.207.9857.